There are many reasons why people choose to use profit stone veneer for their renovation projects. For the biggest bang for your renovation buck it is hard to beat the value of stone veneer. In this blog we will discuss 5 reasons for using stone veneer for your next renovation project. Profit stone veneer can be used to add style to interior accent walls, fireplaces, kitchen Islands, backsplashes and more. In the image below you can see a kitchen island that has had profit stone veneer added to it. Kitchen peninsula with application of profit cultured stone. Here the stone veneer used is a product from Boral the manufacturers of Cultured Stone. The same stone was used on the living room fireplace with stunning effect. For more information on stone veneer fireplaces check out 4 reasons to install cultured stone fireplaces here. Profit stone veneer on living room fireplace. Stone veneer not only looks great, even more, it requires no maintenance when used for interior purposes. Unlike some paints and wood finishes stone veneer does not fade. The image below shows cultured stone used as a backsplash in my own home that has been in place for almost 20 years and looks the same as the day I installed it. 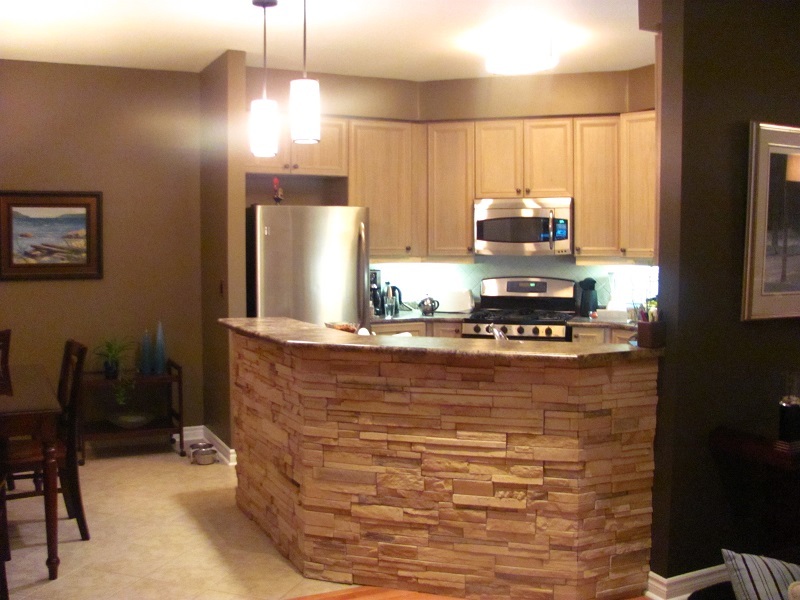 Cultured Stone – Castle Stone used as a back splash in a country kitchen. According to Money Magazine and the 2018 Cost vs Value report you will recoup 97% of the cost output for stone veneer. For the biggest bang for the home renovation buck, it’s hard to beat the visual impact of stone veneer. Below stone veneer creating a modern slick look. 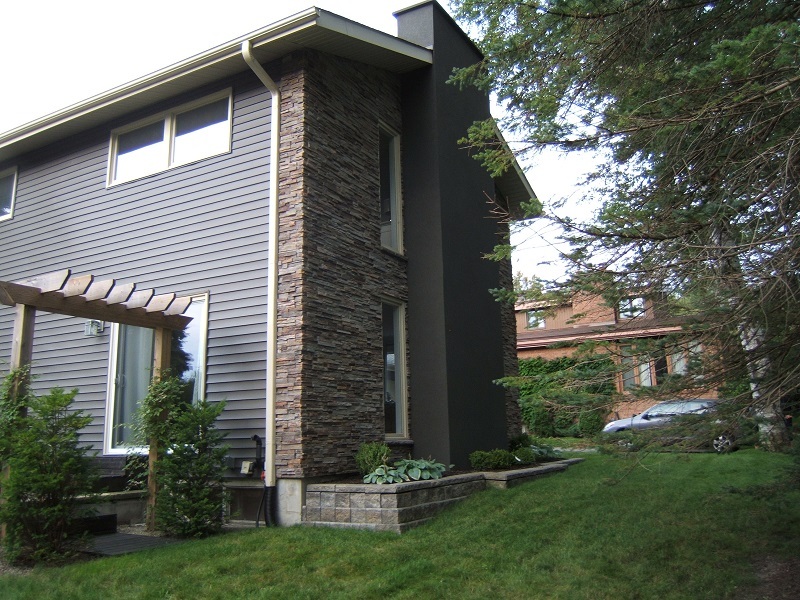 Front view of house with Pro-Fit Alpine Cultured Stone. 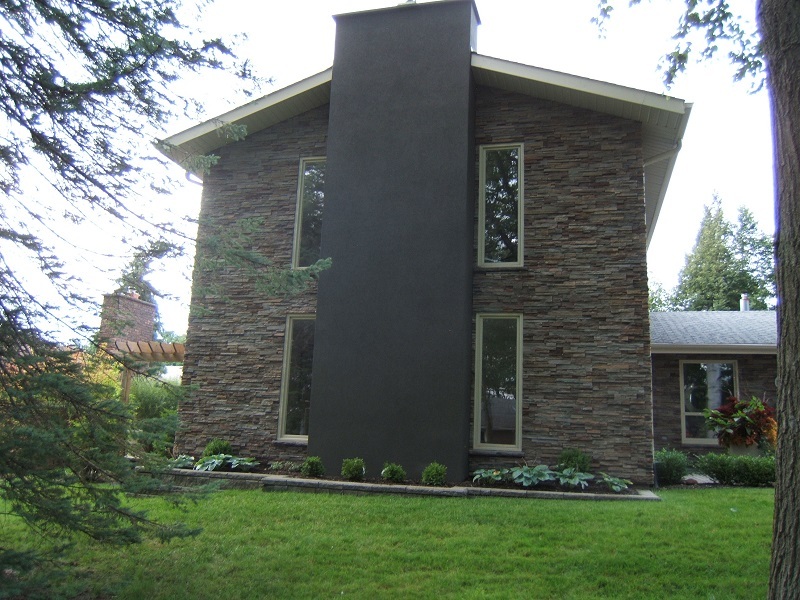 Side view of house with Pro-Fit Alpine Cultured Stone. Most importantly, stone veneer tends to be much cheaper and quicker to install than traditional bed stones. Although the cost per square foot of stone veneer tends to be higher than traditional bed stone it is much cheaper to install. The cost of labour to install stone veneer, on average, is between 1/3 and 1/4 of the cost to install full bed stone. Stone veneer installed by a professional will be indiscernible from natural bed stone upon completion of the job. Most importantly stone has the look of permanence. Humans have been building with stone since the Egyptians and similarly used faux stone even longer. The Sumerians were building with manufactured stone when they built Ziggurats out of manufactured mud bricks. Adding stone veneer to the inside or the outside of your home creates a more natural look and a stunning visual impact. Below you can see the impact of an accent wall made from stone veneer, besides who doesn’t want to create the illusion of a wall that is solid as a rock. Stone veneer accent wall featuring a fireplace.